The Oxford Mindfulness Centre has been awarded a major Public Engagement grant from Wellcome (formerly the Wellcome Trust). The four year grant, starting September, will support public engagement aspects of MYRIAD, a research project investigating the effects of Mindfulness Training (MT) on mental health in adolescence. There is increasing concern about rates of mental ill health in young people and the impact on education and life. 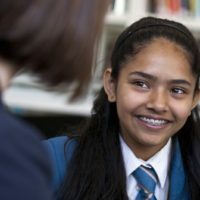 Mindfulness Training holds promise as a means of developing resilience in young people, however there is still public uncertainty about what mindfulness is and the nature of the scientific evidence for it, including in schools. MYRIAD will address this lack of evidence and public confidence. The public engagement project is part of a larger programme of work funded by Wellcome, which started in 2015. It comprises studies examining: the cognitive and neural mechanisms of MT and other (control) interventions on healthy and at-risk adolescents; teacher training, scalability and implementation of MT; and the effectiveness and cost-effectiveness of MT in schools. Professor Willem Kuyken, one of the PIs and OMC Director, says, “We aim to use this grant to involve and benefit young people, inspire their interest in science and maximise their sense of involvement in the research, by finding out their perspectives on mental health”. The schools involved in the MYRIAD research project will be the main audience for the work, building on existing public engagement activities and the considerable experience built up by the MYRIAD team with teachers and young people in schools across the UK over the last two years. The activities will involve young people in a wide range of engaging activities using psychological science methods and empowering them to share their thoughts on resilience and mental health. The schools-based work will be complemented by a project involving young people in developing digital mindfulness and mental health resources with Oxford Sparks, broadening the potential for reaching adolescents not involved in MYRIAD. The new funding will expand on current public engagement work, which has long been a focus for the programme’s four Principal Investigators. UCL’s Professor Sarah-Jayne Blakemore’s TED talk on the adolescent brain has over 2 million views and she has also worked with the Islington Community Theatre on their play, Brainstorm, based around the science of the teenage brain. Other public engagement activities include media coverage, talks and presentations at schools and conferences, social media, science festivals and free events for families and professionals.